I never realized how much I needed these little containers. It makes going from class to the gym just a little bit easier. I am a 135# female and use 1 big scoop protein as needed in my diet and 1/2-3/4 scoop pre-workout. The pre-workout tastes way better than others I’ve tried and dissolves well. It hasn’t left me too jittery. I appreciate the other samples, but the NO2 gave me a headache (I took one before and one after my workout) though I will give it another chance and drink more water and use it for a longer, more intense conditioning session. I wish the ingredients would’ve been listed, especially for the Brain 80. Thankfully I looked online and the product contains St. John’s Wort which I cannot take it with my current medication, so I gave it to my friend and she gave it good reviews. This is a fantastic sample of all the great products Ruck Science has for sale. The Rubgy Whey dissolves great in whatever you choose to mix it in and has a great flavor. The Pre-Game is great to drink on the drive to practice or a game and gives you that burst of energy you need. The NO2 Max seemed seemed to not only help with practice but recovery as well. I took the 80 Brain for a few days and noticed some additional focus but had to stop as I discovered a drug interaction that affected the efficacy of my medical medication. Overall the Sampler scored a try! This is the first item I’ve order and I loved it. The variety of products was perfect for testing them out. I’d never used supplements before, but I’ve seen no ill effects so far. Definitely plan to stock up when the next season begins! Tried it just to support a rugger, I’ll keep using it because it’s good. Whey is tastey, preworkout isn’t as intense as some but you definitely know it kicks in, NO2 boost is subtle but I noticed the extra reps/meters, 80 brain wasn’t like other cognitive enhancers where I’m wired but I felt the added determination. Overall, Good S***. I came across Ruck Science on Facebook and was looking for something to give me a little edge. As an older rugged, I need to do more to both recover from and prepare for training and matches. I decided to try the Sample Stack to get a taste of what these products might do for me. I’ve notice a marked ability to recover from training and matches, which relays helps me to focus on getting better instead and pushing myself instead of just trying to make it to the pitch. I loved everything in the Sample Stack and logged on today to order the full-size products. Quality stuff. Works as advertised. I was initially turned on to the products Ruck Science because I like when the packaging is simple and I can clearly understand what I’m getting. The product packaging, descriptions, and instruction (though a bit informal) is exactly how I would handle my own products if I were still in that line of work. Rugby Whey – Blends well, basic flavor, no GI issues. Good stuff. Pre-Game – Half a serving had me wired without feeling twitchy. I’m an avid coffee drinker, but tend to avoid pre-workouts in a gym/sport setting as they tend to get my HR too high. This stuff tastes good and gets you up. Honestly, if you need more than a half or full serving, rethink your warmup or get some more sleep. Beet Elite – Some notable improvement in cardiovascular strain. Caught my breath a bit quicker, which is everything to me. 80 Brain – Slight improvement in focus in both training and office setting. NO2 Max – Slightly increased feeling of ‘wellness’ after training. Beet, 80 Brain, & NO2 Max form a sort of “wellness suite” of items that I plan on using daily, regardless of my training demands. Very happy with my trial. Ordering the full-sized packages soon. This was my first order from Ruck Science and I’m very pleased with it. My sample stack arrived on time, exactly as described. I will definitely order other products from Ruck Science. Thanks again for a good first experience! Such a solid product! Got mine last week and tried the Pre-Game before my kb workout (my first time with a pre workout supp) and I’m hooked, guys. I’ll be using the rest of the stack as pre-season training starts in a few weeks and I look forward to using the stack bottle on game days to keep my pre-match routine in check. I loved the product so much, I posted about you guys on my facebook page and I got some pretty hefty traffic for someone who rarely gets any of my posts liked. Hopefully my brothers from Nashville Rugby will support you guys as much as I plan on doing going forward! Thanks again for a great product, guys and keep this stuff going! Just took my stack on tour to Canada with me and plan to take it everywhere! It made it easy to take what I needed to and from the pitch without having to worry about spilling. I can keep all of my supplements for before, during, and after in one place. I love that I can throw it on a caribeaner and snap it onto my bag – and the stack stays snapped together so theres no worry of losing anything. The durable containers are great too! They’re strong enough to withstand the abuse a kit bag goes through without shattering and is small enough to stick in my gym bag or carry-on. 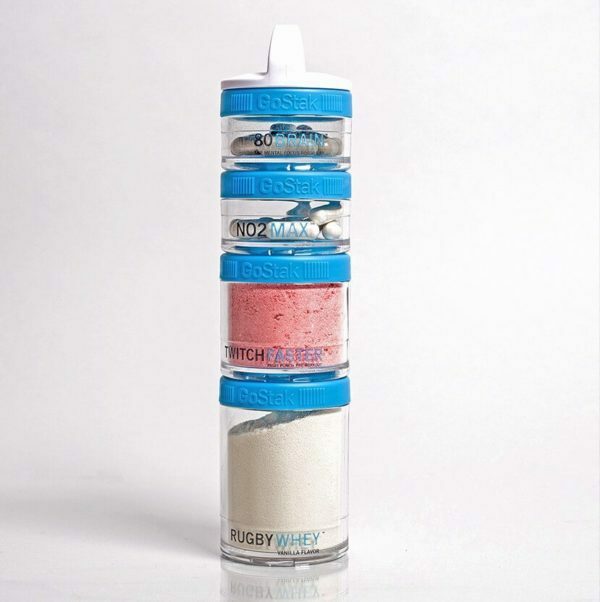 Perfect for every day workouts and the always traveling rugger on the go! I would highly recommend it to others! I already had most of the stack but this is a great introduction to it. I like being able to take it with me to the gym and work my way down the stack. I replaced the 80 brain with some electrolyte powered for the before, during, and after punch.